You are here: Home / General / ASUS Taichi – My Next Machine? ASUS teased a couple of new devices in their pre-Computex promotions, and one of them was the Taichi. As we now know, this devices is essentially a dual-screened Ultrabook (likely sans the Ultrabook label, unless ASUS can convince Intel to allow the trademark on such a different device), and will double as a (relatively thick) Windows 8 tablet. It’s an interesting concept, and one that provides basically the same form factor as convertible Windows Tablet PCs. You get the power and compatibility of the Intel platform, with two very high-resolution IPS+ screens at 1920X1200 and all of the expansion expected of an Ultrabook. 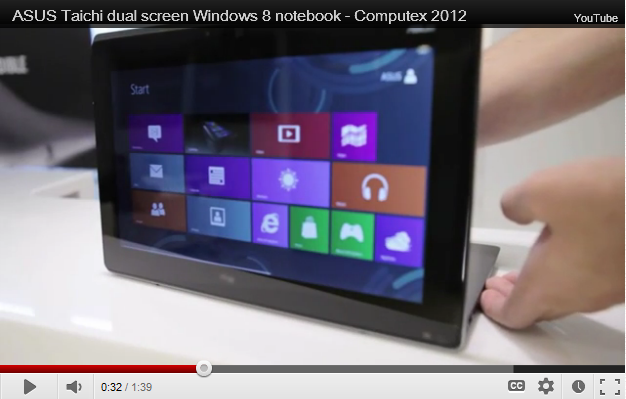 Close the screen (presumably, the video of this hands-on doesn’t show it used this way) and you have a Windows 8 tablet. If ASUS adds an active digitizer and pen, they could have a truly unparalleled productivity machine. As I’ve written about before, pens (not the capacitive stylus typically used with today’s modern tablets) add a very natural and effective means for entering ad hoc information. For anyone who takes copious handwritten notes, such as students and salespeople, a tablet with an active digitizer is a powerful tool. Regardless, I’ll be in the market for an Ultrabook sometime toward the end of this year, and so the Taichi could be an interesting option if they can make the outside screen strong enough to withstand the beating a normal laptop’s lid typically receives. Also, ASUS will need to make the thing light enough and thin enough to be comfortable as a tablet, while still working well as an Ultrabook. It’s a daunting tasks, but ASUS has shown the ability to make innovative and useful devices with the Transformer-like line of Android (and, soon, Windows 8) tablets. Let’s see if they can avoid some of their mistakes with Transformer Prime, and make a truly great device. Update: Looks like the device to sport an active digitizer and pen will be the Tablet 810, an 11.6” version that uses Wacom for the handwriting portion. Given Windows’ inherent support for handwriting recognition (assuming that makes its way to Windows 8), and this could definitely be an interesting device. I’ll be keeping a close eye out for this one.